The 21-year-old has been on loan from Premier League Brighton since the beginning of the year, but due to an ankle injury suffered at Cambridge United in January he has to date made just three appearances. The left-back returned to the match day squad last weekend after a three-month absence, making a late substitute appearance in the 1-1 draw with Mansfield Town. He is keen to get more game time in the remaining four matches of the season, starting with the Good Friday date with Macclesfield at the PTS Academy Stadium, but for now that is as far ahead as he is able to think. Brighton’s defeat at home to Cardiff City on Tuesday night means they now face a real fight for their top flight survival, and Cox admits his parent club’s situation has probably muddied the waters further. 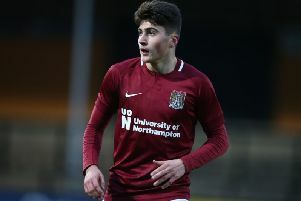 The player has enjoyed the time he has spent with the Cobblers, and in Town boss Keith Curle he has an admirer, but when asked if he would be open to a return next season the player was non-committal. “Yeah, of course,” said Cox. “But I have to weigh up my options and see what is happening.